An exhibition of photographs by Paula McCartney and Lex Thompson titled The Explorers Club is currently on display in the Schaefer Gallery on the campus of Gustavus Adolphus College in St. Peter. With support from the Johnson Endowment for the Arts and the Gustavus Artist Series, the collection will be on display through December 8 with hours from 8:00 a.m – 5:00 p.m. daily. An artist lecture will be presented on Tuesday, November 5 at 10:30 a.m. followed by a reception in the gallery at noon. The lecture, reception and exhibition are open to the public. The Explorers Club, named after the New York organization founded in 1904 to promote scientific expeditions and research, brings together the work of photographers Paula McCartney and Lex Thompson, each investigating environmentally polar opposites, from ice and snow to tropical islands. Utilizing different means of investigation, each artist asks the viewer to reconsider the way in which they perceive the photographic image in relation to the subjects it portrays. Paula McCartney’s images in A Field Guide to Snow and Ice illustrate her interpretation of the idea of winter. After moving from San Francisco to Minneapolis, she decided to explore the snowy landscape, however, at times without being out in the cold. She now sees winter everywhere, in every environment, in every season and categorizes it by pattern, shape, and line rather than merely by substance. This guide includes images of snowfalls and wildflowers, frozen waterfalls and stalagmites, snowdrifts and piles of gypsum sand, as well as other icy forms in order to explore and reinterpret natural structures and the way they can reference multiple ideas on both micro and macro levels. Elements are abstracted from the vast landscape to illustrate the winter of her imagination. The ambiguity of scale and substance helps the subjects transcend their source. With less, there becomes more. 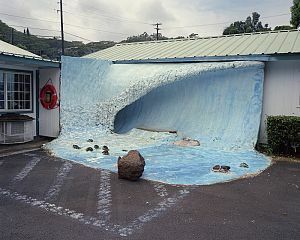 Lex Thompson’s series of color photographs, Mahalo, is titled after the Hawaiian word for “gratitude,” one of the few Hawaiian words that tourists learn, and subsequently overuse. It was added to the Hawaiian language only after early visitors noted the generosity of the native people despite their lack of a word for gratitude. This series explores the collisions that occur within the modest perimeter of these socially, ethnically, religiously, and environmentally diverse islands. The body of work is composed of photographs made on five different islands, images made from television and cinema depictions of Hawaii, photographs of collected artifacts, and drawings of photographs that he wished he had made but failed. The images create a portrait of Hawaii that both reinforces and subverts the prevalent image of the islands perpetuated by Blue Hawaii, Magnum P.I. and Fantasy Island. Film and television create a mythic Hawaii in our popular imagination that is distant from reality—a distance that is just as difficult to traverse as the Pacific Ocean was to settlers and colonists. The breadth of images in the series collapses the distance of the Pacific Ocean and the idealization of media portrayal of the Hawaiian Islands. The Explorers Club exhibition will be open for viewing through December 8 in Schaefer Gallery with an artist lecture and reception at 10:30 a.m. on Tuesday, November 5. Schaefer Gallery is open daily form 8:00 a.m. – 5:00 p.m. and is open to the public at no charge.